What do you do after H1B visa approval? I’m sure, it should be been a roller coaster ride from H1B Visa application, Lottery to receipt notice. Then comes H1B Visa approval after a long wait. Getting your H-1B visa approval is the first step of your journey to towards your dream and a long career ahead in the USA. Not the mention the decade’s long green card wait time for EB2 and EB3 applicants from India and China. Question: What happens after your H1B Visa is approved? Typically, after an H1B petition is approved by the USCIS, the agency will update the USCIS Online Case Status website. Get H1B Visa Stamp in your passport and then enter U.S.A. (after H1B Start Date). 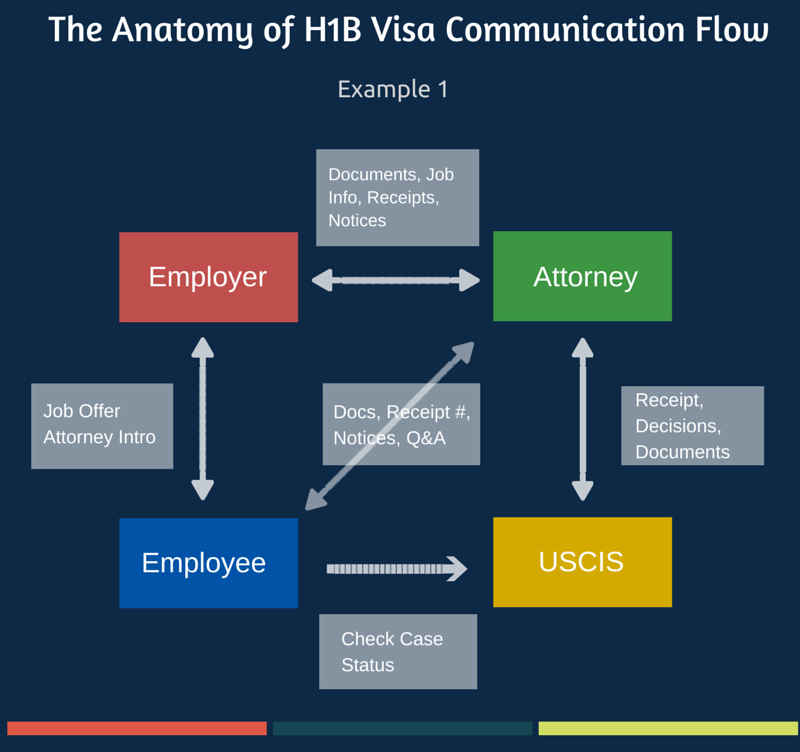 Here’s the communication process flowchart between you, your H1B sponsoring employer, the immigration attorney, and USCIS. After your H1B Visa is approved, you have to follow the path back from USCIS. You have to understand the concept of H1B Visa and Change of Status. H1B Visa petition can be approved with Change or Status or Without Change of Status. This condition primarily applies if the applicants are located within the USA or outside the country at the time of H1B Visa petition. H1B Petition Approved with Change of Status (COS) if you live within the U.S. If your H-1B visa petition is approved with COS, and you live in the USA (F-1 visa to H-1B, L-1 to H-1B, L-2 to H-1B, H4 to H-1B, etc. ), you can start working starting on or after H1B Visa start date as mentioned in the approval notice. Typical H1B visa start date would be October 1st if the application was submitted during the month of April. You will be required to get H-1B visa stamping ONLY when you travel outside the U.S.
F1 to H1B: Your status will change to H-1B from the H-1B’s start date, even if the OPT period is valid for a few more months. H4 to H1B: Your status will change to H-1B from H4 on the H1B Start Date. If H-1B visa approved without COS, and you live inside the U.S., you will have to travel outside the U.S. (to home country usually), get H-1B stamping in a U.S. consulate, and enter the U.S. up to 10 days before October 1 if your Approval Date is on October 1. You may have different questions with respect to this situation. When can I get stamping? Can I get stamping before October 1 and enter the U.S. on H-1B? Can I get to continue to work with my current visa status (L1, L2 or OPT)? You have to consult an immigration attorney to get all the necessary answers to your unique situation or for additional questions. This situation usually applies to those who had applied for H-1B visa from outside the U.S.A. If you have your H-1B approved, have to get the H1B stamp before entering America. You can go for H-1B stamping to your nearby American consulate. Check with the US consulate on the earliest time and date to appear for your H-1B visa stamping interview. However, each U.S. consulate will have varying rules. So it’s always best to check with a consulate first before booking for visa interview date. You don’t have to wait until September or October to get Visa stamping for H1B. I live in New Zealand, but I’m a citizen of UK; where should I apply for H-1B stamping? I had my H-1B petition approved from last year, but my employer is asking me to wait since the job situation is not good in the U.S. What should I do? Always consult an immigration attorney to get your questions clarified. If you have a unique situation, be willing to spend some money to get your questions answered by an immigration expert. If you live outside the United States, you can schedule your H1B visa interview. You must know that you just cannot go for stamping without the knowledge of your employer and receiving all supporting documents. Here’s a list of documents required for H1B Stamping. My current project is ending on Dec 28th 2018. My current H1 is ending on Dec 31st 2018; My current I94 validity is until Jan 10th 2019. I got a new project with a start date Jan 2nd 2019. If my employer file for extension with the start date Jan 2nd 2019. Is that ok to start working in regard with my status? Use the forums for discussions. Thanks. My current H1B extension was denied and my I-94 was expired on 18 Aug,2018. Meanwhile I have got approval for other employer with I-94 validity from 13 Sept,2018. Now, my current employer is asking me to leave the country as my petition was denied. My joining date with other employer is after 3 weeks. Can I put resignation and wait to join other employer ? My H1-B is approved along with the change of status from F1 to H1-B , but I did not get it stamped yet. My parents are coming to US for a visit. My question is how should they respond on my visa status question at the port of entry?, since my visa status says F1 on my most recent I-94. Can Someone please help? I went back to India and changed my F-1 Visa to H-1 B and visited back US on H-1B. When I went to DMV they are saying I am still on F-1 Visa, so they insisted me to change my status to H-1B and come back. Can some one help me to find what is the ideal solution? It takes few days for the Database to sync between I-94 and DMV. Try again few days. Show them your I-94. Mine is a tricky situation. A little background – My H1b petition got denied because of the change of end dates of my contract in the vendor and prime vendor letter. My F1 visa has expired but has an active legal F1 status till MAy 2019 and also I can extend the status by extending my coursework. My situation is my employer is ready to H1b again in April 2019 with the same client where I am working now. But with some personal issue, I need to travel to India in the 2nd week of April 2019. Once I go back to India, I won’t able to work to the client as I won’t be having a legal status (but still I can get legal CPT status) and also can not come back as I won’t be having valid visa Now comes the question. 1. If the client allows for me to work remotely for 2 or 3 months can I work in India and run US payroll? – an assumption, I have authorized CPT and went to India on vacation. 2. If my H1b gets picked and if I won’t be working to the client what are the chances of it getting approved? – an assumption, I have submitted the client letter, SOW etc. with the application itself. 3. If my H1b got approved, during the stamping can I submit different SOW and the client letter other than the one that I did submit with the application? Any help is appreciated. My Visa interview is happen on June18th and counselor has taken my passport. But at the end of interview he didn’t informed me that your visa is approved but told that after 1 working day you can be able to receive your passport. When i checked in the portal on the status of Visa on 19th June 2018.. it is as follows: Your Visa is currently undergoing necessary administrative processing. This processing can take several weeks. Please follow any instructions provided by the counslar at the time of your interview. Iffurther information is needed you will be contacted. If your visa application is approved it will be processed and mailed/available within 2 business days. case created:15th June, Case updated:18th June﻿. I am bit worried on this status, can you please help me to understand this status. It happens and there’s nothing you can do but wait. Hi, My husband recently changed from H1 to B2( still pending status, not yet approved). The new employer transferred his H1 again and it is in premium processing currently. I travelled India when he was on H1 status and I do have visa stamping till March 2019. Do I need to go for stamping again after his H1 gets approved with new employer? Hi now I am on opt ead and my husband is on f2 status. This is year I am going to file for H1B, if I got approval, then how I have to update my husband status. Your employer will file H4 visa along with your H1B application. My Employer ‘A’ filed H1b visa for me in April 2017 and got picked in lottery, got RFE, submitted all documents to USCIS Waiting for approval. If my Visa gets approved can I do a immediate transfer to Employer ‘B’ as I got full time job and working with Employer ‘B’. How much time will it take to transfer my H1b visa and what all the documents required to submit USCIS. I have to file for my H1 extension (Current Expiry date is March 2018) and my companies attorney is asking for a client contract which should be valid for 6 Months post March 2018. Let me know if you have seen this before. I have a weird situation. I’ll be travelling from New York to India via Air France and my layover is in Paris-Degaulle airport. My passport was stolen on 05/28/2017 in Los Angeles. I applied for a new passport in the Indian embassy in the US and have reported the lost passport to the US consulate in India. I have my new passport with me. I also have a scanned copy of all the pages of my stolen passport which includes the copy of my F1 visa that expires in July 2018.. I have the copy of the police report that was filed when I lost my passport. My H1-B visa got approved and I have my H1-B authorization form(I797) and H1-B receipt notice and hence I’m travelling to India to get my H1-B visa stamping. Your question boils down to one sentence – DO you need Transit Visa for France? You should check if Transit Visa is required for Paris. Only French Consulate can answer this question. If you are in doubt, change to Emirates or Qatar or other airlines that have connection in the Middle East. my H1B visa is approved i received my approval note on 28th november in that they mentioned COS is denied. 1)i have opt extension up to 2018 july is still valid or not?? 2) when can i go for the stamping?? 3)if i go late for the stamping is it a problem?? 3. No, it shouldn’t be issue, but I would switch to H1B at the earliest and not wait until July. My H1B petition got approved in Sep20016, and my petitioner is now proceeding for stamping in Dec2017. my question is related to DS-160, Currently I am not working in H1B petitioner company and also not yet resigned in current company, So which company details I should mention in DS 160 as current company. Is it necessary to work in petitioned company, while going for an H1B interview. I would list where you are working right now as current employment. I went for H1B VISA stamping on 24/03/2017 and got 221g blue slip and submitter all my original documents including I-797B and my experienced letters then after six months 20/09/2017 I received my I797B and experienced documents, Now what could be the status either I need to go for again stamping or what should i do ? Could you please update anyone knows? Hi Raghu, In my approval notice my location consulate location is mentioned as Chennai , India. Currently i am staying in Kuwait for some project work. H1B 6yr year period will start after my COS (Change of Status) i.e when I reenter USA on H1B status or from October 1st ..??? 1. Since the consultancy hasn’t replied for rfe yet, could I travel to India on h4, he said that dec 1st week is the deadline to reply, So could I return by that time, So that Once I am back, they can reply for RFE. 2. If I wait until my H1b is approved, Can I change my status to H4 back and then can I travel or wud this create any complications, coz once h1b is approved they say pay stub has to be generated. 3. wat would be the best option for me to travel to India in this situation. I wanted to visit home before I start my job. Looking forwardat your best advice. Hey – RFE and travel puts you in tough spot. Please consult with an Immigration Attorney to sort this out to understand the nuances of the issues. My case is approved for H1 B cap for year 2017. Now i am leaving current employer which files H1B & joining another employer. I did not have petition copy with only i have WAC no. What should i do. Is i am eligible to stamp by next employer OR my petition is waste. My next employer is ready to stamp. But which document i needed to get stamp by next employer. My approval notice has mentioned Montreal consulate, now i have moved to Calgary. I need to know am i allowed to appear in interview in Calgary or i have to fly to Montreal. If yes what is the procedure? My H1B visa has been approved with a change in status (F1 to H1B). I am travelling to India in the second week of October and will have to get my H1B stamping done in India. What documents do I need to carry with me to the US consular office and how much time does it take to get the passport back with the visa stamped? After visa is approved, you should get the passport within 3 to 4 days. Your Attorney should give the list of documents. I have a valid F1 visa till 2021. My H1B lottery is picked up this year. Can I travel to India after the case is approved and re-enter USA with the valid F1 visa? Is there any risk involved in it? If I can return on F1 visa what is the last date I can enter with F1 visa? I got selected to start a 3 years residency program at a major US university. They applied for my H1B visa and I just got all the documents from them. They told me to go to the US Consulate´s Officer in Dublin (I live in Ireland) to get the H1B visa stamp on my passport. Unfortunately the communication with the US embassy here is very complicated. I haven´t understood if I have to complete the D160 form and pay another fee (the university already paid more than 2k USD) and schedule a meeting with an interview or if I should just go there and get my passport stamped. Can you please help me in understanding what should I do? Thanks in advance! I feel really frustrated by all this bureaucracy. P.S: also my husband will join me in the US. Should he apply separately for an H4 or should we do it together? My i129 petition has been approved without change of status from h4 to h1b. I have received i797c notice of approval. I need to go outside US for visa stamping in order to start working and return back with COS. Since I am still in US, can another employer file cap exempt i-129 petition with COS as I am already counted in previous year cap ? My company applied for the H1B but are now saying that there are no projects. I ‘d like to know How long is the approved petition valid for and when last can travel to US ? USCIS approved my I-129 form a day before Trump announced federal hiring freeze. Right now even my employer (federal government) does not have enough guidelines on what will happen in my case. My start date was March 5th. Now, I am wondering if I am unable to get the above position. Can I apply for another position with another employer without having them go through H1b process (since mine is already approved) ? I had filled H1B first time and was approved in Ocotber 2016. When i went for stamping i was issuecd 221(g) and after 2 months my was petition sent back to USCIS for further review. 1. If i find a new employer will I still be cap exempt? Is my petition still valid and can be considered for cap exemption.? or will it be a new h1b and i will be placed in lottery? I got I94 extension till 2019 March along my new H4 extension in 2016 September, and my H1b got approved in December 2016 without I-94 extension. Here I got some confusions..
1. Do I need to go back to india for stamping or can I continue with h1b? 2.What are the options to get a valid I-94, without going back to my home country for stamping? I would like to know about the scenario when H1 visa is selected in lottery in month of May and if someone has to travel to India in June/July and return to USA within 3-4 weeks. In this scenario the H1 visa is filed through consultancy and the beneficiary is currently in USA with H4 status. Please let me know if this is advisable and if not what are the consequences. My H1B has been approved and i am staying in india. But the location where i want to go for work is different state than the petition filed for a different state. So what shall we do ? I have two options below. 1. Shall i go for stamping and then I shall travel to US to State mentioned in petition and from their i shall get I-94 and filled a Ammendment for location change with new LCA. 2. First my employer shall filed a ammandment petition for new work location with LCA and then i shall go for stamping and travel to the exact state where i am going to work. Please can you share pros and cons for both the options or are they correct options to chose. My H1 transfer is approved by employer B (new employer) and I received an approval notice. But my company (employer A) had already filed a location change amendment, which just got an RFE after the transfer approval to B. Can I join B without any issues/legal hassles? Please advise. My H1B was on RFE. It got approved on 12/06/2016. I have recieved i797 a with notice date of 12/06/2016 , expiry of 12/06/2017 . Prior to this my OPT ended on 09/26/2016. My OPT extension came in effect from 10/01/2016. What should be the next steps for me ? Will the H1B come in effect from 10/01/2017 ? Can I travel to India in March ? Do I need to get a date from consulate to get H1B Stamping in India? I have a H1B COS question.. I’m on L1 and it expires on 04-June-2014 (family L2 also expires same day). I am applying for H1B COS on 01-APR-2017. I will NOT be travelling out of the country. L1/L2 extension is also being applied by company. If L1/L2 extension is applied and approved, can my family travel to India in June/July 2017, get L2 stamped in India and return on L2 BEFORE 31 July 2017? Even if my H1B COS is approved either before they travel or while they are travelling in June/July? I could then apply for their H4 COS in end August once they return on L2, maybe on 1st August 2017? Is this a practical scenario? I’d really appreciate a response. My extension of H1B i129 was approved last week and I am living within US now. Which category does this come under. Living within US without COS? Will I have to go for stamping to stay in the country? I just got a new Job Offer, is H1 transfer now a good idea? please use Ask Raghu or Ask an Attorney. After RFE, the cases which gets approved under regular processing, does their status later changes or “Case is approved” is the final status?? Ideally how much time it takes for the approval notice to reach at our end? Sumit, if you want faster processing, then convert to Premium. Else, it can take months and there’s not time limit. What will the case status online if COS is denied and H1b is approved ? I have checked my status online and it says , we denied your i129 and mailed you the decision . I feel this might be becoz of the COS as i was not there in US while applying the petition . I filed the petition under masters quota and with COS .
Let me know what does my status mean . Im yet to get the mail . I think you have to wait for the notice to reach your employer. currently Iam on H4 status and applied for H1B 2017.My case got picked up in the lottery and current status is RFE. We are planning to upgrade it to PREMIUM . 1) My doubt is if my Case gets Approved with in couple of weeks ,will my status automatically changes from H4 to H1B or I will be still on H4 status. My employer suggested me that ” your status will change only after applying for SSN ,till then you will be on H4 status”. 2) Can I travel on H4 with Approved H1B(no COS) during Nov end/Dec 2016 and return back to US on H4. 1. your status will change only after applying for SSN ,till then you will be on H4 status – Is totally wrong. 2. Consult and attorney. Why are you asking questions impacting your status on forums? I have got my h1 approved october 20th. My case falls under h4—>h1. I have applied for SSN in near by office. Now my question is after approval how long i can wait to fetch my first job? As there are not much requirement during November and December month. My employer saying till january I may have to wait. Is it ok to wait for more than 3 momths after my H1 approval? are there any issues? Please help addressing tis issue. There’s no wait time. You are on H1 and you should get paid! My employer files an H1B cap-subject petition for an F-1 student on April 1st. The H1B petition requests a change of status from F-1 to H1B, with a start date of October 1st. My OPT is valid until October 12th. The H1B petition is approved on October 27th. I traveled to India on June 20th and reentered the United States in F-1 OPT status on July 15th. Do I need to immediately travel outside of U.S. and get my first H1B stamping or Can I continue my Work on H1B ?? Talk to your attorney. Looks like your COS was abandoned. My situation is similar to yours. I am traveling to India in couple of weeks opt valid till 2019 but H1 is under process. Travelling outside US when H1 B is under process is that a problem? can I travel and come back without any problem? whether can I come back to US? I need your suggestion regarding the travel. Please respond. I live inside USA and I have valid status. But i am planning to change it to H1B. Unfortunately, there is no empty pages left on my passport. So, may that be an issue while applying to H1B (inside usa) with a passport without empty pages? Another option is to renew my passport and submit application that way. I am willing to renew, only if applying with old passport (valid but pageless) may cause any problem. Why are you hesitant to renew your passport? I got my petition approved till September 2017. But I work for some other client from the same employer in a different country and wouldn’t be able to travel before the expiry date of my petition. Wanted to know if my visa is unstamped before the petition expires, What option will I be left with ? I see few forums where they say that I will be eligible for Cap-exemption for next 6 years . How far is this info correct? Appreciate your advice or help on this. Yes 6 years is correct. I found your video really helpful to understand the process. However I have a bit tricky situation. I ll be grateful if you can guide me for this. I’m not sure how you can work in L after H1 is approved with COS.
1.Consulate name on approval is Chennai do we need to for Chennai Consulate Only for Stamping ?? I met with Accident and i am not in a position to travel back to Chennai for Stamping will this reason would be good enough as i have already booked a Slot at hyderabad. I stay outside US, I have Valid H4 and my H1B is also approved now, can i travel to US with H$ and get my status change to H1B ? If yes then what would be the approximate cost of status change ? My H1 b petition is approved 2008 June , I didn’t went for stamping . Is that petition is valid now ? can i take got visa stamping with that case ? Not its not valid. You need to apply via lottery. Hi, my OPT extension is valid until June 2018. I am filing my H1b in April 2017. 1) I need to travel to India between April and July, will there be any issue? 2) Can I get stamping done in June 2017 (assuming my H1b gets approved and start date is Oct 1 2017)? HI, my H1b extension (129) and H4 extension (I539) applications together filed on Feb 02 , 2016 , h1b has been approved on 06/15 , but the h4 extension has not been approved till now . when i check the online status it shows that “On May 26, 2016, we transferred your Form I-539, Application to Extend or Change Nonimmigrant Status, Receipt Number EACXXXX , to another USCIS office. That office now has jurisdiction over your case. We sent you a notice that explains why we moved your case”. Dose the h4 extension approval usually takes this long after the h1b is approved ? is this usual? is there any way i can contact USCIS and get to know more about this ? i will have to travel to india next month . Check the Processing Time, usually, H1B and H4 gets approved at the same time. I have been working on my OPT status to the same client since 10 months and my employer applied for h1, It got picked up in lottery and received a RFE. Very recent my h1 petition got approved for one year. Due to emergency I would like to travel to my home country on 7th October 2016 and return in Nov first week. And I’ll be working remotely. Is it fine to go for h1 stamping by taking all pay-stubs till September, As my October pay-stub will run on November 15th. (or) Am I suppose to have October pay-stub i..e on H1 status. (or) Is it mandatory to have latest 3 months of pay-stubs from October on h1 status to go for stamping. In advance, Thanks for your advise. Congrats on your H1B Approval. Where are you getting information that you need 3 months pay stubs? Go for stamping and did you ask your employers attorney? I am currently on OPT with “H1 Approved status” starting from Oct 1, 2016. I am currently working with a Client A on contract for a year. I must have to visit India from Dec2 -Dec28. I am taking appointment for H1b Stamping and H4 visa for my wife. But my client job can be terminated before visiting India by Oct10,2016. Is it possible to continue with my trip to India? I have a question about changing of visa status. I got the approval notification that my H1b application was approved last Saturday and it will affect as of Oct 1st. As I was with F1 status and it will finish from Sept, during one month I don’t have no status. Is it dangerous? if so, what should I do for a month? Please advise. Thank you. Once your H1b is approved and your opt expires, CAP-GAP OPT kicks in. Thats measn your OPT will be extended till Oct1, when your H1B becomes active. 1. My current H1B visa expiring in 31 Dec 2016. I want to schedule my spouse H4 visa interview on Dec 2nd week. Is there any risk to get H4 visa, since my visa is expiring in next 2 weeks. 2. I am go to apply for H1 B extension. meanwhile i want to schedule visa interview for my spouse on Dec 2nd week with the existing petition which will expire in 31 Dec 2016. But before interview i will get my new H1B extension petition. So my question is, when my spouse goes for interview, is she can request the visa officer to consider the new petition. Which option is good, please advice. You should ask this with your attorney. 1) You need to enter petition no in ur wife’s DS160 . So assuming that, u enter ur old petition will give ur wife a visa expiry of 31st dec. In this she cannot travel and neither u can extend her i-94 based on ur new petition. within 2 weeks. I was working on h1b visa in usa from 1-2 years for same client. We got new client new location so filed amendment. Now things here are going good so thinking to change to new client and new location again. So can we file one more amendment without any issue when the previous petition is still in progress? I am on F1 Opt working for a company. My H1B(i797) Got approved on may 17th, 2016. Activation of my h1b is October 1st 2016. My spouse live outside of US. They are going to apply for h4. Can you tell me when can they apply for H4? Can they apply before October 1? If you have the approval notice for H1B, then can apply for H4 now. 1. What is the maximum duration I can wait before going for stamping. will it be valid to apply in 2019? Ask via Ask Raghu service. Thanks. I am currently in India, I got my H1B Picked and yet to be approved. Meanwhile, I am getting married in Dec 2016 and would like to travel on f2 ( My fiancee is on OPT). After going there i would like to change my status to H1B from F2. Can this be done ? After approval of my petition, how long can i wait for change of status or getting stamped ? I am in US with H4 visa and my H1B Petition with Change of status is picked up in the lottery this year and is currently in process. But due to unavoidable situation ,I need to travel to india. I latest available H4 stamping date I received is 30th Sep.
What will happen if I enter the US on 1st October with H4 stamping ? Whether my H1B will be denied etc? Talk to an attorney and figure out the plans and status. 1.Before Oct 1st can i travel to india and come back on H4 .Will my stamping have any issues? 2.After getting my H1b approved by Oct , can i travel to india by Dec before joining my employer and come back in jan to join work , what will happen if i go for stamping in india at this case? 3. what happens if i leave US before october and couldn come on time. what wil happen to my H1b? and stamping. Follow the Comments Policy. Thanks. Why not get H1B stamping and enter US? I agree with your attorney. Currently I am on F-1 Student Visa. My H1 is approved for the FY2017. I moved to new the address now (Different State). Updating the address in USCIS website is sufficient or anything else is required? (The LCA received is having the old address). To provide more details; (I have the option to chose two different places. Based on that the following are the cases that I landed up). Same company, same role. But the office location is different and the new address of residence is different state. My H1 is approved as consular processing for FY2017. Need to go for stamping to activate my visa. Could you please provide the procedure in this case. I have removed parts of your comments. I will answer them in a video. Don’t have an ETA. I want to share my question to you hope I will get the answer. My employer(In US) applied I-129 for 2015 and it got approved in july 31 2015 . I was trying to go for masters at the same time so I took both chances parallel . Waited for i-129 approval but don’t want to waste the chance of F1 visa. F1 got approved early so entered in to US as F1 Status on july 29 2015 and I-129 approved on july 31 2015 as my h1b is not applied with COS it dint changed the status automatically . In short – Yes, but is hat H1 petition still not revoked? I am currently in same situation. Were you able to find out whether we can apply for COS or how did you go forward? Hello raghu, thanks for sharing the information. Question I have is my husband was in F1 and went ahead with divorce. Last october 2015 my passport got stamped for F2 visa and approval came till 2020. So I think I lost my visa status. So if I get my H1b visa picked up in lottery what should be the answer at the time of interview for why I did not go bk on F2? You should ask the same questions to an Immigration Attorney. Firstly , Thank you for the information provided in this website . 1. I’m currently in USA with H4 visa and i’m planning to apply for H1b this year .Since the H1b process takes until October , Is there any possibility that i can go back to my home country after filing H1b and come back in September or October with H4 and then change my H4 to H1 in USA? Please post your question in Q&A section. I am Ram. I have completed Masters in Computer Science and currently pursuing MBA on F1 visa. I have already used my OPT and OPT extension. I am looking to file H1 visa. My question is, can I start working on H1 visa once I get approval from USCIS or will I have to wait to work until October until stamping? My case got recently approved. I have two queries in regard to stamping. 1. Till what period my attorney/employer would receive the i797 approval Mail notice. Is their a validity associated with it. For ex. Once you receive i797, within 40 days you should go for stamping? 2. I am currently in Singapore. Can I go for stamping here in US consulate rather than going for stamping in India? I am currently in USA on h4 visa however I have an approved h1b petition which is not stamped. Now my employer wants to apply for change of location, so I want to understand that once my company applies for an amendment to change location and it is approved, do I need to go to my home country to get it stamped or it is not required until I go outside US? They would have to file COS from H4 to H1 ( and they can do in Premium). My employer processed my H1 last year and luckily my petition was selected in the lottery as well was approved. In USCIS site, my case status was changed to approved on July 16, 2015. But employer says that he has not yet received the 797. My employer’s attorney has filed a service request too with USCIS, but no updates yet. Is there a way to track the status? It has already been 6 months since i received my approval. Is there any other way to expedite the process or get information from USCIS. Please advise. I don’t think it will take that long. I have an approved H1 visa in 2008 with a valid I797 petition until oct 2011, however i didnt went to consulate for stamping. Consultant with whom i processed my H1 is no longer reachable. Am i excluded from quoata process if i want to process /transfer H1 with new consultant? H1B from withon previous 6 years will not count under Cap. Thanks Raghu. So its a negative in my case and ill be counted in cap? It counts based on effective date or expiry date? I stayed in Us in L1A visa from 2009 to 2011 and returned back to India without doing L1 extension. Does it help for any cap exempt? Refer to application form I-129. See the questions in there. You can do the math from there. if my H1b is approved with change of status , do i need to go outside usa to get visa stamp ever? Only when you travel. You can start working on H1 as per the Start Date listed on the Approval notice. My H1-B petition for change of employer was approved(my prior visa status was F1 ==> OPT==>H1(previous employer)==>H1(transfer to current employer) and I would like to do H1-B stamping. I am an Indian citizen, so is it true that I should have my initial stamping done in India only ? or can I go to any country to get H1-B stamping ? I can’t help you here. I could say that you can get it stamped from another country ( as other have done in the past). But, if you get denied, I’m the one to blame. So, seek legal counsel in this case. Sorry. My new employer has filed the H1b transfer in October 05 2015. I think it will be extension of status and it’s gonna take 7 months in regular processing in VSC. I got a situation Herr, I got my approval notice for H1B 2016. My passport is changed after I applied my H1B lottery due to spouse name addition. Now in ds160 I have filled new passport details. I have both passports with me. And new passport have details of older passport in it. Will there be any issue with that on stamping. I’m not sure. You have 3 options. I am in India. I have my H1B visa approved. My employer has filed for H1B amendment for new location. Location change is from my employer’s location A to location B.
I have been asked to travel with the new LCA approved and Fedex receipt number of the H1B amendment. Travelling to US for the first time. Is this OK or should I atleast wait for the H1B amendment receipt notice to travel. As per USCIS website, filing is mandatory but approval is not to work in new location. Your emoloyers attorney should answer this question. You can also post it via As an Attorney here. I have asked US HR already and they advise that travel is possible with the FedEx receipt number. But I wanted to confirm if that is ok as lot of websites say amendment filing receipt no should be there and some say fedex receipt should be enough. I have just received an online approval of my h1b application (finally) and am awaiting the approval notice. I am already in the US. When can I start working for the employer? Do I have to await the approval notice before joining the work force? Congrats on your H1 approval. Depending on your status change. I would wait for the approval notice. It should come to you within 2 weeks. My H1B Status still in Received status from sep 11 2015.I have to go to India in another 10 days. 1)If i get the approval before i come back and COS is applied ,Can i get H4 stamped in india and come back to US on H4 Visa? 2)What will happened to my H1B visa if COS is applied and come back from India with H4 stamping ? 3)My employer says that the COS will be applied along with the H1B petition.Is that true ?When will the change of status will actually be applied ? Post the question to Attorney Murali via Ask an Attorney. I got married after 10 days of my H1 stamping. If I apply for H4 visa of my wife with in 1 month after my H1 stamping, will it cause any problem when my wife goes for stamping. I am still in India. Be practical. You have to be worried only if are doing anything wrong. My H1B visa has been approved and I am waiting for my Stamping. Now that I have got an offer from a new organization, is it possible to transfer the Visa from my current organization before stamping. If yes, Could you please let me know what would be the process of transferring the Visa before Stamping.? Same steps as applying for new Visa. You should have the Approval Notice with you. I attend my visa interview from Dubai or India, Kindly advice. Thanks. You have to get the documents first. I’m not sure where you can attend the visa interview from. Yes, you can use the 1 year validity passport to go for visa. THANKS AS ADVISED I WILL GO FOR STAMPING WITH TWO PASSPORT AS MY H1B IS ALREADY APPROVED. I have a question, please guide if you can. My status got changed from H4 to H1. Can you please tell me what shud I do to correct that ?? What are the time lines for this modification?? I can’t work without SSN and I can’t get SSN with this issue?? I have got a valid H1b approved petition from my current employer. But i couldn’t see my employer sending me for visa interview. Can i approach a different employer with same petition number to proceed with my H1B stamping. Yes. You should have the approval notice (I-797) form. My H1B Status still in Received status, what should be the deadline time to change the statues? Hi Raghu, I have couple of questions. 1) I had received RFE. My employer resubmitted documents and USCIS received it within the RFE response date. Still the status show it is under review, I am not sure what is the processing time in general. 2) My H1B is filed by employer based in Seattle. My current employer Dell India wants to me to work for them in Austin. I think I can work as consultant initially and transfer H1B. Even when I work in consultant, is there any process that should be completed before I travel from India. MY H1B employer is OK to work with Dell in Austin. My question is there any time period I will have to stay in Seattle before I move to Austin or I can directly go to Austin and work with Dell. Hey – Please schedule a 15 minutes call. You can attend the interview as a family ( H1B and H4) together. My H1 extension got approved under PP on 30th Nov 2015 as per USCIS website. But i have not received hard copy of documents. My employer says it could take upto 4 weeks. 1. I plan to travel to India on 20th dec. Can i travel to india in case i don’t receive the hard copy of updated I797 by 20th dec? 2. My current i94 is expiring on 19th dec. Would that be a problem as i plan to leave US on 20th dec? Of course, if i receive the hard copy of I797 by 20th dec the above problems will be eliminated. Please advise so that i can plan accordingly. Thanks. Are some people still awaiting their h1b visa approval? I am and just want some company in anxiety. yes , responded to RFE in NOV 2015 . DEC 2015 – still waiting for final decision .. I am on the place as you are. Replied Rfe in November , still waiting for results. I moved from chicago to Pittsburgh, my H1B LCA ammeendment for location change is applied in Jul’15. My H1 stamping was expired and my currrent petion is valid up to Jan’16. I have applied for premium H1 extendion this week. I have query that once my extension is approved then , can u travel to India and get my stamping done if my amendment is pending for approval? Can yo ask this to your emoployers attorney or you can ask Attorney via Ask an Attorney. They are the right person to help you. Is client letter mandatory while attending H1B visa stamping. My petitioner has sent me WO agreement between petitioner and client for whom I will work. Its a direct client. Can you tell me as per your experience, are they gonna change this status after sending 797( sent or something)? It will say – Post-Decision Activity. But, there’s no status for mailing the notice. If your employer is not giving the letter, then you have to go with what they have given. Sorry, They gave Master service agreement and PO copy between them and client. Will that be enough to show employer and employee relationship or still end client letter is required ? Ask your attorney or submit this via Ask an attorney by Email. I’m in H1B Status now and planning to transfer to new employer. Suppose assume that i’m transferring in next month December. I will started working with new employer next month . I have plan to visit india march . First Do i have any problem in visa stamping? Second How tough to get H4 Visa? If your stamp is valid, you can reenter US with that, you don’t have to get stamping again. Thanks for this information. As you said, many of us are still awaiting the H1B approval. I have responded to an RFE and am awaiting the final approval, hopefully. I have been postponing travel abroad because it is not suggested while approval is in process. How soon do you suggest can I make travel plans after my H1B is approved (if it does)? Will I have too wait for 3 months to get the three payslips or can I travel and join my employer after coming back? Get approval, then stamping. H1B will have a start date, so you can enter upto 10 days before the start date. Thanks a lot for the response, Raghuram. As a follow up, in your experience, if I get an approval so late in the system (November / December), generally how much time will I have between the visa approval date and start date (for working). Secondly, if the start date is very soon, can I join the company say a week or 2 after the start date. As I had mentioned, I will want to travel back home before joining the company (so looking to get a stamping done before entering US again). Will it pose a problem while getting the visa stamped? You don’t necessarily have to start working on the start date. Some people are waiting in India without having an opportunity to travel with H1 approval. I don’t know if the start date will be Oct 1 or day when they approve the petition (after Oct) and it doesn’t really matter. I am in US with H4 dependent visa in which I wasn’t authorized to work. On April,15 a Company A filled my H1 work visa. Visa got picked in lottery , then RFE and then finally approved on 12Nov,15 . I am still waiting for I797 from my company A. But now I got an offer from company B. I want to join company B instead of A. 1)Do you think my visa can get transferred to company B?? 2) I don’t have pay slips as I never joined company A. 3) can you tell me after H1 approval, is it any rule to join employer immediately or is there a some certain time duration ? My H1B has been applied from an MNC and it got approved. But they did not send me for stamping. I have only LCA – ETA form 9035 & 9035E. It is possible to go for stamping from other MNC/consultancy with this details? Please share some information wrt this. I have my visa stamped this September and I want to travel in the month of March. Is this a problem at port of entry- specific to, “Why I am traveling after 5 months of stamping”?? Is it mandatory to get the H1B VISA Stamping after the H1B is approved. (Or) How much time do I have, to travel outside the country and get the H1B Stamping? Will it create problems during H1b stamping in India during interview ? If you do premium processing, then you can get approval in May/June. People are still waiting for H1B results filed in April 2015. You need paycheck only if your started working on H1. Thanks for your response. Now my question is can I change my employer in May/June immediately after getting approval ? Please share if you get any answer so to your question. Mine got approved on 12 Nov, Still waiting for 797. I want to transfer to new employer once i got my 797. I am in USA on L2 EAD valid till Oct’16 and my H1 Visa without COS got approved on 29Oct’15. What is the grace period to file the COS now? Till when can I continue my job on L2-EAD? Questions affecting your status should be answered by an attorney. You can continue on your current visa till your H1B is stamped. You can go for H1B stamping till the date 60 days before its valid. Why are you giving incorrect info? Stamping is not required unless you leave the country and enter again. My H1B visa got approved in India on a company which is in US and I have not yet travelled to US, now I wanted to get transfer my approved H1B visa to another MNC company which is in India and on this company I wanted to go US and work. Yes you can but you need the approval notice. Yes, you can transfer your H1. My H1B receipt received on April. Still my application is not approved. my status showing as below. Can you please tell me what is the percentages of cases still approval pending with USCIS. My employer is saying security check is going. what exactly this security check and how many days it will take. Check the Processing Time at USCIS page. It’s taking longer than usual for H1B processing. I got my visa Approved under Premium Procesing yesterday. How long does it take to recived the hard copys to my petitioner? My Employer from India, I have my client at Location X and Location Y. My opening is at location Y.
I am planning to go to Stamping for location X and then file an amendment since I dont require to wait for the approval notice. If I file an amendment, I have to wait for the approval notice and then go for stamping which might take more time. Is it ok to go ahead for my Stamping. I have an H4 visa and live in USA. I am applying for cap-exempt H1B by my prospective employer’s petition with premium processing. 1. Once USCIS receives my application, will the decision on approval of H1B be made in about 15 calendar days? 2. Once I check that my H1B is approved on the internet, can I start to work right away? Or, do I need to wait until I receive the hard copy of approval from USCIS? If so, how long does it take to receive the hard copy of approval after the decision is made? 1. Yes. 15 calendar days to get the decision. 2. I don’t know if you can start working if online status says approval. I think you have to wait for approval notice, because start date will be visible only in the Approval Notice. Approval notice for premium processing is normally sent by email to the Attorney (or the Employer) who filed the petition. So, you can start working immediately. You get the original in 2-3 working days. You can start working only after the start date on I797 approval notice for new H1 petitions. Thank you for the answers, Rao and Raghuram! MY H1B visa got approved in the Month of August, 2015 in the USICS site but my Attorney didn’t receive any hard copy from US. Could you please tell me how much time it will take to receive the Approved petition. Your attorney can ask for replacement copy of Approval Notice. Thanks Raghu for quick response!! Could you please tell me how many days it will take for replacement copy of Approval notice. Thanks. thanks for this updated information. It’s very helpful. I’d have a question. I just got the approval notice for my H1-b (posted on the USCIS site – didn’t receive the physical papers yet). I have a touristic trip planned in the US in 2 weeks and won’t have the time to get my Visa stamp at the embassy by then. Can I enter the US safely as a tourist for a month or so, and then return to France to get the visa stamp? Could it harm my visa to do so? Could I have issues at the port of entry airport because of the H1-B pending? I don’t know the answer. You need to ask an Attorney. I am on h4 dependent on my husband h1b. Both of our visa’s got expired as of sep30. We have applied for the extension and we have got the receipt. We are currently stating in US. I need to travel to India by this month end. My husband employer filled for my extension. I just wanted to know the risks in traveling to India now. Will my extension application be cancelled and do I need to apply again? If my husband visa gets approved by nov15, do I need to wait for the documents? How much time will it take? Also, I am planning to apply for h1b for next year. Can you please help me with this? H1b extension is taking about 5 months for regular processing. You can do premium for faster approval. If documents doesn’t come by the time you leave then you can ask your employer to mail it to you. If my visa is not approved by the time I leave, will it be cancelled and do I need to apply again from india? My H-1B Visa Petition Approved by USCIS as of Aug 12, 2014, but I could not appear for the H1b visa interview last year because of some mishap (met with an major accident). – Can I go for H1b visa stamping this year with the petition approved documents? If yes, I need to get updated project/client related documents from the employer who filled. – Since i don’t have much contact with the previous employer, can i apply for H1b visa on behalf of different employer with the same approved petition? You can transfer your H1 to new employer and they have to send the required documents. Plus, check to make sure your H1 is not withdrawn. Hi, My H1B Form I-129, Petition has been approved for this year 2015-2016. But I have left from the company which applied my H1B. Can i still get my H1B stamped? If yes how.? No you can’t. You need to find new employer. Transfer h1. My petition is approved for the year 2015. But company x filed my petition when I was in place A and two months it moved me back to place B. Should amendment be filed before Oct 1?? Talk to an immigration attorney with new rule about location change. Please correct your article. Once you get your H1B stamped, you can enter the United States anytime after September 21st which is up to ten days before the October 1st H1B start date. Your article mentions that we can reenter the US only after October 1st. Yup, I have to correct that. Thanks. interesting … how to apply for dutch passport ? I had an offer from a US startup and they had filed an H1-B for me, and I had made into the cap. I had not scheduled my visa interview, and I didnt join that company. This year if I want to go for a job or higher studies in US. I would need to H1B, F1 respectively. So, will my last year case have any impact on this year, as I didn’t go last year. I am in USA on H4 visa. and want to convert my visa to H1B visa next year. I am searching for consultancy firms who will file my H1B visa. I had a talk with a firm and they said they will file my H1B visa & after I will get approval they will search for a job. Is this a right thing to do ? My petition got approved. I have to go for stamping in Chennai. My wife is expecting and she will not able to travel anytime soon for the stamping. Is it ok, if I stamp my visa first and then my wife and kid go later on. I know the alternative is to wait together to go as family. But I am considering the former option. Any problems with it? My consultant applied for H1B on June 5th 2012 (with my OPT expiring on June 25th 2012) and I got the Cap gap extension till Oct 1 2012. On Aug 25th 2012 my consultant asked me to apply for premium processing as my petition was not yet approved and my cap gap extension was going to expire on Sep 30th 2012. I paid for the premium processing and the consultant informed me that they are going to apply for premium processing on Sep 5th 2012. When I checked my status online on Sep 6th 2012 I noticed that my petition was approved 🙂 with the following message. Now Im confused If my petition was approved on the same day they received my request for PP ? or It was just a coincidence and my petition was approved on the same day using normal processing ? 2) If it was normal processing then Is it a good idea to ask USCIS for Refund without going through much Drama ? 3) If I can and should then What’s the procedure ? NOTE: I paid for the entire H1B processing to my consultant and I dont wanna pay any extra than Im suppose to pay. I just got this notice, but does it mean I got approved to technically be H1B status? Or, are there still any possibilities to be rejected? A friend of mine introduced me to this blogg since 2010 before coming to US for my Masters. Since then I have acquired alot of helpful information that has helped me tremendously. I would like hear about your experiences or your advises on H1B visa stamping in Canada. 1) Due to the nature of my project, it may be difficult to travel to my home country within a short notice. This is reason I considered going Canada instead. 2) If I travel to Canada after 1st October, and there is a delay in H1B visa stamping, how can I return to US? Please help me by providing answers to these questions. I am very new to this blog. I hope i could find an answer to my question . I got my H1B application approved and also done with the stamping on may 2012 . But to my bad luck , as there are no projects from client who filed my H1B i decided to transfer my H1B visa to an other client which has some projects that suites my profile . As my visa tenure is only for one year , and my amendment transfer is going to filed on August last week . So when my transferred petition approves i would be having only 4months from the visa expiry . So in that case i need to attend visa interview again to make my travel. So in that case , if i go for stamping again (as my stamping is done earlier with other client) will there be any changes of rejection in visa interview . Please let me know on this. My visa stamping is done on May 2012 in Hyderabad . I hope my next visa stamping is also go to be in Hyderabad .Could you let me know whether there would be any chance of rejection in next visa interview ?. I have H1-B petititon approved in 10th October 2010. And petition validity is till October 2013. Since then i am in india, and did not attend US consulate for stamping. Now my employer is not ready to offer the job as i am in india, Pls suggest how to get into USA. My friend wanted to take the legal action he is having all the proof when the money transfers etc…. What are the chances for legal action and getting the money back? I am currently on L1B and I have applied for 2011 H1B in Nov 2011 ( Quota was available after Oct also ) and it is in RFE status right now. RFE is answered and I am waiting for the reply. Should I quit the present company ( where I am working on L1B ) and start working with Employer who applied H1 the next day it is approved ?? If I have applied for H1 in March 2011, it would have got activated on Oct 1, 2011, but since we have already crossed that date, I am not sure what will happen. I want some time ( may be 1 week atleast ) to resign from present employer. Has any one got H1-B petition approval notice ? Can anyone tell me, how much time is the USCIS taking for the petition processing now a days ? I am currenty on h4 and recently got an h1b visa… now for saftey purposes had also filed other h1b with diff company earliar. Now my ques is , I knw i can work on 1 h1b at a time. but what will happen at the time of stamping.? I have valid H1b petition until 2014. Went for stamping in Hyd and the status is pending. How can i go to US now ? Also, i have a b1 from the present company. Now can i use my b1 to go to US and stay there with the H1b Approved petition ? I recently quit the company i was working for. What happens to my H1 b status? How do keep it active? I am in india right now. I am working for company A on L1B. Company B is filing H1b for me. Company B is a consultancy company. 1. If suppose if I get full time from company C before 01st Oct can I directly join in company C and work for them. 2. I have not signed any agreement with company B. Will company B create any problem for me? Hi , i have been applied H1-B for visa through my employer and i got the visa and the visa validity expires on March 7,2012. currently i am in India. please let me know how many days before the expiry date i have to reach US. because i can extend my visa when i am US only. Hi All, my freind works in USA and came here to get his H1B visa stamping.He forgot to get his tenth ,12th, and undergraduate certificate originals.He is having all scaneed copies.Will there be any problem? I’m in L1, recently I received my H1B approved under Consular Processing (for Nonimmigrant visas). My L1 is valid until Jul 2012 and H1B until Nov 2012. 1. If I get a new job from a different employer, can the new employer use my current approved H1B petition and apply for transfer or may be L1 to H1 with COS (cap excempt) or any other option? Or my H1B has to be stamped in my passport to be eligible for employer change? 2. Going to Canada for my H1B stamping a good option? I’ve 4 years work exp. in the US, I’m in the same location and same client. I’ve my client letter, pay stubs, W2 forms everything clean. I’ve never done any studies here in US/Canada and I’m from India. I am in same shoes of yours , please provide expert opinion on what you have done with your case or any other suggestion? I got my h1b petition approved filed by my previous employer couple of days back. Is it possible to transfer it to my new employer. I only have the receipt number with me. 1)My H1-B was filed using I129 in November, 2011. 4)Can the new company utilize my approved petition? I currently live in the US. ( was on H4 earlier). My H1B Petition was approved with Change of Status (COS) for 2012 on Nov 3rd. My start date mentioned in the petition was Nov 1. Now my employer is saying that they want me to start from Jan 1 2012. I would like to know if this will cause any problems when i go to India for my H1 Stamping?? Would i have to explain why there is a gap between my approval and commencement of work? Could you please tell me the process how you got the H1B.I am also looking for one. I am currently in US on L1 visa and checking options to moving to h1b visa. I have my h1b petation approved in 2008 when I was in India but I have never used that and never go for stamping. Later in 2010 I come to US on L1B visa. Now I am just wonderign if I can use my older h1b approved petation somehow if I want to move to H1B visa. I got my H1B approved for the year 2012. I have not gone for stamping yet. For some personal reason, I am quitting my job with present employer( who filed my h1b). My question is: If I find a new employer who can transfer my h1b or re-join the same employer after 6 months, Will my h1b be still valid? What is the consequences of never stamping or late stamping ? Please help me guys, I am totally confused on this. If you have converted your H1 with I94 than you can no longer work with your current employer on L1 – your current working is in violation of immigration laws. If you have got H1 without I94 than you can work on L1 and the H1 is not valid till you go to your home country and get it stamped. My Employer file H1B visa under Premium processing. From USCIS website my status is confirmed as “Approved”. I am expecting that hard copy of my Visa documents will reach to my employer within next 10 days. Due to some personal circumstances, I have resigned from my present employer so my visa interview will not be scheduled and I will not go for Visa Stamping. My question is what are the consequences of not having the visa stamped immediately. Will my visa become invalid or will it still be valid after few months? I can return back to work to the same employer or different employer after few months. 2> If I join a different employer after 6 months. Can he transfer Visa or will apply new visa? Shilpi- did you get an answer to your query? I applied for H1-B in 2007 and it was approved. I was given the EAC number but my consultancy didn’t provide me the documents and i didn’t go for interview. Now i am again applying for H1-B and my new employer is asking the receipt number or the approval number of my previous application which i don’t have. Will my current H1-B application get rejected because i don’t have these details? I got my first H1B approve in Sep 2011 for 1year. I am planning to go india and i want to know whether stamping is possible or not from India in present situation. my time period exceeds means from india i can Apply my H1B or not. My L1 is expired for company A with valid I-94. Now company B has filled H1B as COS and it got approved with start date after one month of H1B COS approval date. 1. Will the company C file new H1B (on what basis) . Please advise what should me the best approach here. To transfer you need atleast one paystub, regarding petition copy and approval notice – they are your property and legally they cannot keep it with them. to transfer you need the approval and EAC #. 3. Can one more L1 to H2B COS is possible (I mean based on my L1 expired however 1-94 is valid) – If the new company filed H1 with I94 than your I94 is nolonger valid. You can however apply for L1 renewal if you have not used up 5 year of continous stay on L1. i got my first H1B approve in Oct 2009. I came to india and got H1B stamp in my Passport valid until September 2012. After coming to US i changed my status to F1 in June 2011. I got F1 Approval in June. Now again i am filing H1B. Once this H1B get approve if i travel to india in February 2012 do i need to go to US consulate to get H1B stamp again or my old H1b stamp will work. My applied for H1B through my current employer. I got my H1B stamping done last year in Sep 2009. But still, I am not able to fly to US, as my employer is not sending me to US due to some professional rivalry reasons. Kindly guide me what should be my next step. I know there is recession there in US, but in my case the reasons for not being able to land there are different. Can I try for H1B transfer from here in India itself? Do I need some documents and letter from my employer before I fly to US? I need to get my H1-B stamped on my passport, I’m a Chilean citizen currently living in the U.S, I need to know if I can do this process in Singapore because I have to be there in 2 months! i have a cap exempt h1b ends june 30 2011, and now i am on B1 pending status that was filed before the end of my visa. i have new employer and will file h1b cap counted next week. I am a Canadian who has been working in the US with TN visas in the past. I have been granted an HB Visa as of Ocober 2010 but have not returned to Canada yet. My first trip to Canada will be August 2011. My question is, where do I go to receive this stamp I read about ? All the numbers I try online don’t help. How do I make this appointment, and with whom? I’ve tried the CDN immigration website. My hus’ H1 approval happend in 2008, but he didnt attend the interview for stamping. And now his petition is getting expired in july 2011. 1. Will he be able to go and attend the stamping? 2. If yes, what will be the visa validity he can expect? Did you get the answer of yr question? I am also in same situation. My H1b approval is expired last month. Should I have to appear again for visa count ? My H1B premium process petition denied last month, now what could be the next step? file MTR or appeal. pls suggest your valuable guidance. I am with the F1 status and currently living in USA and doing 2nd masters, both from USA; but my H1B has been approved from April 1st for a university research job. I am in the middle of finishing my last semester of school. My question is how many days do I have before I join the work and use my H1B status ? or if i rephrase the question : within how many days a person has to report to the employer and start working once the H1B has been approved if that person is currently living in the USA? You don't have any gap. From April 1 your status will be H1. You can continue to study while in H1, but you cannot be studying full time and not working when H1 is approved. even if my h1b is for a non-profit institution ? Can i leave country and return back to US before my H1 starts OR do i need to do H1 stamping before i come back. Since i am going in Dec 06, 2010 to Dec 19,2010. I m doing Msc biotechnology. I m planning to go to USA. Is there any company who can do H1 B visa can just reply me. For H1B ,Is ther need to submit my Birth certificate since my date of birth is different in College certificate and Birth certificate. My Spouse got H1b approval on Oct 2008 bcz of the bad economic condition she didn't attend the Visa Interview for H1b. She came to US in H4 Visa in 2009. Is her H1B approved on Oct 2008 is till valid ? If yes, Can she apply for COS from H4 to H1 using old H1 approval ? Please Help. I have been approved H1b for teaching through my first degree in education, thus bachelor of education in science. However, i have also pursued a masters degree in Environmental science with which i am working right now. Can i be denied my h1b visa stamping because currently i am not teaching? I am getting my H1-B start date as 1st Dec 2010. Can I travel to India anytime in last week of November and get it stamped on 29th November(as this date is before my H1B start date). Is there any special rule for this type of scenario? I am MS Graduate.I am on OPT extension its valid till 03-15-2011 and i have valid f1 visa. I am currently working as a full time employee Programmer analyst in e-verified company. I have to visit India for 20 days( father not feeling well) planing to leave may last week or June 1st week. Can i travel India during the H1B processing time.? If i go what will be the problem to my H1B? can i re-enter USA on my F1 visa without any issues in port of entry?. or can I travel after my acceptance of H1B. in that case while coming should i need H1B visa stamping or can i re-enter on f1 only? What documents should i carry in both situations(processing time and after acceptance of H1B). Please help. dont mess up your career cos of ur old man.. say in the states until you get ur h1.. old man can wait..
Hi! I need your urgent LEGAL help. I got my aproval notice for an H1B and now I am back in my country in order to stamp it in my passport. Before I left he US I was a transfer student since March 2009 until August 2009 and as I didn’t leave the country during that period of time my only proof of study was my approved I-20 which I took with me to my interview today. The embassy told me they were going to put my case on hold until I get a DHS aproval or authorization that proves that I was in legal status in the US but the Institute were I studied says that’s not possible because they only give I-20’s and they don’t have any other documents but a letter that certifies that I studied there during that period of time. I’ve never heard that before and I am very concern because I need to know if there could be any other document that my school can present or how can I contact the Department of Homeland Security , otherwise the embassy will not stamp my visa. I will appreciate any legal and serious advise on this matter. @Fanny – We don't provide legal help. You will need to talk to an Immigration Attorney for your situation. My H1 is approved with COS. I am awaiting for documents from my employer. I just want to know what all documents I have to collect from my employer. Also after receiving my I797 notice, can I go and apply for SSN? My H1 has been Approved. I wasn’t planning to go to India for H-1 stamping this year. My Green Card process may start early next year. “Is the H-1 Visa STAMP required to start the process for Green Card”? I have been approved H1 B Visa in year 2008 and it has been stamped on my passport also. My employer hold me till todate. Now My employer requested me to come to USA. My question: Is there any problem in entering to USA as I am going after one year of approval? I came to US in 2006 for my Master's. I did not get my master's degree yet and luckly i got my OPT started lasy year. I started working since 6 months in pretty big company. My H-1B got approved recently as my employer applied it through Bachelor's degree. Now company forgot about my master's degree. But during H1-B stamping what should i defend, if questioned about this? I also got a 5 motnhs gap in my OPT period. Will there be any serious issue duing VISA interview. I am a little confused as to when to have my visa stamped. My change of status wasn't approved, so I will have to leave and get my visa. I'm currently travelling and was wondering if I have to get my visa stamped by oct 1 2009 or if I can get it stamped in December when i go home? I've got my H1B application approved for the FY2010, the visa is valid from 01, oct 2009. I'm Indian, rightnow doing job in Singapore. I've received all H1B related documents from my employer. I wanted to schedule the consulate interview at Chennai, India where my H1B documents are sent for stamping. As per the agreement with my current Singapore employer I can not take casual leaves during my probationary period, till Sep-09. So i wanted to schedule the H1B interview by the second week of Oct-09. 1. Can I attend the interview by oct-09? 2. What are all the details/documents required for scheduling the interview? 3. Will there be chance for getting stamped if I attend the interview late? It would be of great help if you can answer me the above questions. 2. What are all the details/documents required for scheduling the interview? – Refer to US Consulate website and Required Documents list in this blog. 3. Will there be chance for getting stamped if I attend the interview late? There many waiting to attend interview who got H1B approved last year. You will be fine. I am in US and my status is F2. I just got my H1B approved. i wanted to travel home and go for visa stamping but as i was going through the procedure they require pay stubs and i don't have any as i don't start working until the October 1st 2009. will the US consulate deny my visa if i don't have my pay stub? will be it be better to go for visa stamping before or after october 1st 2009? I am in US on F1 visa now. I got my H1 approved and it starts from Oct 1 2009. But my attorney filled the form incorrectly. Instead of checking Change of Status, they indicated that I am outside US. My attoryney applied for an amendment on June 2nd. Got the recpiept on amendment but havent heard anything from USCIS. Does anyone know how long an amendment takes? My congratulations for people who applied for h1b visa, got approved and best wishes for those who are waiting for the notice. Any people in my situation and got information regarding this,help please. My H1B case has been approved but my employer filed my wrong date of birth on form I-129 which is reflected on approval letter. Please let me know what should be done to correct my DOB??? with my understanding that in the approval notice the name of petitioner will be available in this case your name and how come do you know your date of birth has been entered wrongly? did your employer provided you a copy of h1b petition application to you? Even for my wife the DOB is wroing in the I-797. The DOB is in the new I-94 which is at the bottom of the I-797 document. My Lawyer already applied for the amendment, but we didn't get any confirmation from them. Can you please tell me whether we can go to stamping with this ammendment details. I've a similar situation. Could you tell me what happened to you case? As per mine, the attorney sent an ammendment request to USCIS for the corrcetion of DOB on I797 and today I got the status update saying "Ammendment notice sent". Does this mean they sent the reciept that they received our request? or is that an approval notice? Please share your case. I just graduated with Bachelors in Computer Engineering from a US university this august. Can i apply for the H1 B visa NOW?? Else when is the earliest to do that?? I have got an H1-B approval with COS and my H1-B starts from Oct 1st 2009. My OPT ends Aug 31st but the change of status thing covers the month of sepetember as part of the "cap-gap" cover. Can i get my H1 stamped in August from canada and re-enter US in aug or i need to wait until 10 days prior to october 1st ? please help. I have a similar query and was wondering if i can get my H1B COS stamped before oct 1st 2012… what did you do? Please help! Is that really true that once you got H1 visa, you can't move to the US 10 days before your job start? I live outside of the US, and only 10 days to find apt and get ready to work?? I feel it is too short… My attorney said it's a rule, but have anyone moved to the US more than 10 days before? I am not sure how strict the immigration about it. I have the same doubt. Although even I remember my attorney saying the same thing… that we cannot enter US atleast until 10 days prior to Oct 1st… I am still wondering if thats true or not. I have the change of status and H1 is approved, Why this article say that i will be on H1 after October 2010, i thought it's October 2009. Ganesh – Thanks for highlighting it out. You are right. H1B will be active from October 1, 2009 if you have applied for this years 2009-2010 quota.